Green Bay's City Stadium, historic home of the Packers, was built in 1957 at a cost of $960,000 and was dedicated by Vice President Richard Nixon. It held 32,150 fans. The stadium name was changed to Lambeau Field after the death of Curly Lambeau in 1965. Over the 38 year history of the stadium, there have been seven additions to the facility's seating, increasing the capacity to today's level of 60,789. Most recent addition to lambeau field was in 1995 when 90 additional private boxes were built. Recent additions were in 1995 and 1990, when 90 and 36 private boxes and 1,920 club seats were constructed. This brought the total number of private boxes to 198. The 1990 project cost $8,263,000. The theatre-style club seats were installed in the south end zone on both sides of the scoreboard. The area is both heated and air conditioned and equipped with elevators, concession stands and restrooms. In 1995, a season ticket for a club seat sold for $81 per game. Please note, that when researching the seating capacity figures, I have seen conflicting numbers, sometimes by as much as 80 seats. The figures I used are from an official publication of the Green Bay Packers, Inc. The playing surface at Lambeau field is natural grass; always has been, always will be. The first game at City Stadium was witnessed by 32,132 fans on Sunday, September 29, 1957 against the Chicago Bears; the Packers won 21-17. Green Bay city ordinance provides that no alcohol or carbonated beverages, cans, bottles, ice chests, coolers or jugs can be brough into the stadium. If you are attending a game, and someone needs to reach you in an emergency, they can call the stadium at (920) 496-7711. The parking lots open 3 hours prior to kickoff and close 2 hours after the game. Additional parking is available next to the Brown County Expo Center across Oneida Street. Tailgating is permitted in the parking lots. Tailgaters must occupy only one parking space and are asked to dispose of used charcoal in the cement containers located throughout the parking lot. Fans with special parking needs and whose vehicles display a universal disability symbol may either park in Lot B off Lombardi Avenue on the north side of the stadium or Lot A off Oneida Street on the east side of the stadium. If you experience car trouble, look for one of the AAA trucks cruising the parking lots, starting in the third quarter up until 1.5 hours after the game. December 20, 1996 - Frozen Tundra? The Green Bay Packers paid $50,000 last week to a Virginia company to haul sod in heated trucks, then re-sod most of the surface at Lambeau Field. Says grounds supervisor Todd Edlebeck: "It's a name we got a long time ago. It probably started in the Ice Bowl and it stayed with us. So many announcers say, 'frozen tundra', as the mud is flying up. The mud wouldn't be flying up if the ground was frozen." KANSAS CITY, Mo. 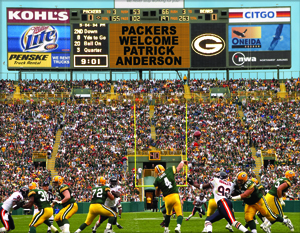 -- Following months of research, the Green Bay Packers have selected Ellerbe Becket, whose sports architecture office is based in Kansas City, to develop comprehensive construction plans for major improvements and additions to Lambeau Field, announced President Robert E. Harlan. The projected improvements will be designed to enhance fan's enjoyment and comfort on game day at the stadium and expand its potential as an entertainment center for the foreseeable future, Harlan said, explaining, "What we're trying to do is make 'Lambeau' modern enough that we can stay in this stadium for 20 to 25 years." Ellerbe Becket has been chosen, he added, because of the success it has had in renovating the Notre Dame and University of Missouri Stadiums, as well as the innovative approach it demonstrated in designing the Bank One Ballpark for the Arizona Diamondbacks, Major League Baseball's newest members. "Ellerbe Becket totally remodeled Notre Dame Stadium and also did a major remodeling job on the University of Missouri Stadium," Harlan said. "They also designed the Olympic Stadium in Atlanta, the Joyce Athletic Convocation Center on the Notre Dame campus and the new, state-of-the-art Bank One Ballpark for the Diamondbacks. Those are obviously impressive credentials. "What we found equally impressive, they showed us in our discussions what we could do to create additional entertainment features in the stadium," Harlan continued. "We then took the combination of the various ideas presented to us and sat down with Ellerbe Becket to develop an overall plan." Ellerbe Becket will design a new concourse, press box, stadium club and additional seating for the stadium, Harlan said, adding, "It may take us as long as four or five years to complete what we want to accomplish, but the primary objective is to make the concourse a much larger and safer area for our fans. We expect that portion of the project to be completed for the season of 2000." The concourse is important because all 61,000 fans use this area when they come to Lambeau Field. Improvements of the concourse will include more women's restrooms, double the number of concession stands and establishment of at least two retail stores. "We're very proud to be part of this project," said principal David Murphy of Ellerbe Becket. "Lambeau Field is rich with heritage and history. This heritage provides a great foundation to build for the future." Initial construction on the first phase of the project is expected to begin in January of 2000. In the interim, Harlan announced that work is anticipated to start in January of 1999 on improvements to the team's football facilities. These improvements will include expansion of the training room, conversion of the current weight room to a players' lounge and construction of a new weights room at the west end of the administration building, adjacent to the gymnasium. While the Green Bay Packers have said they believe a new stadium will be needed in the next 10 years, they have not ruled out the possibility of renovating Lambeau Field for an extended run. In a meeting with the editorial board of the Green Bay Press Gazette, team officials said the deciding factor would be whether the stadium could be renovated so it would generate sufficient revenue to keep the team competitive. The Packers are in the midst of a minor renovation program that will add more premium seats to the stadium. A larger renovation program was rejected because the revenue generated would not have justified the cost. All regular seats in the house are already sold out and there is a long waiting list. Luxury suites are also completely leased and there is little room to add more. An earlier study suggested that adding more, along with the necessary support, would rival the cost of a new venue. 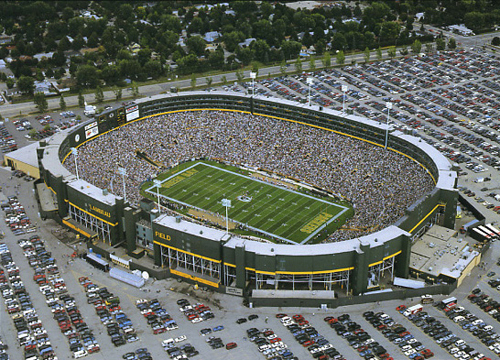 July 7, 1999 - (AP) The Green Bay Packers can remain financially competitive at Lambeau Field for four more years, team president Bob Harlan told more than 7,000 shareholders gathered for the team's annual meeting. After that, Harlan said the Packers either must build a new stadium or make more than $75 million in renovations to Lambeau Field in order to keep up with the spiraling salaries and signing bonuses of the NFL. In Green Bay, where the local time is always 1963, the citizens worship their Packers with religious fervor, and Lambeau Field is their ageless cathedral. The benches are aluminum, the grass (when not iced over) is resplendent, and the fans are rabid but realistic without being rude. No wonder Packers players leap into the stands after scoring touchdowns. On a truly cold day you can feel the spirit of Vince Lombardi -- even if you can't feel your toes.